Gasteranthus is a genus of 38 species that are closely related to Besleria but whose fruits are, in all observed cases, fleshy capsules which split open at maturity rather than berries. In at least several species, the fruits are splash cup in design, splitting open revealing the seeds to the trees and sky above such that the seeds are dispersed by being splashed out from raindrops, condensation, or being close enough to a stream splash zone. The flowers are either dramatically belly shaped, hence the genus name, and with keyhole openings, pollinated by hummingbirds, or more open bee pollinated flowers. There are several additional species that bridge these two flower types by being intermediate between them. 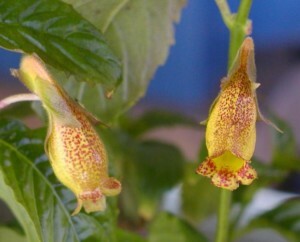 The flowers tend to be pretty unique and quite attractive, on plants that range from small herbs to large shrubby herbs. The plants often have beautiful foliage as well, but can be a challenge to grow successfully and bring into flower. Gasteranthus species come from wet, shady forests in Central and South America often associated with stream areas and all require constant moisture but with good drainage, relatively low light, and high humidity. Numerous species in this genus have also demonstrated a form of asexual reproduction relatively rare in this family, with secondary shoots often developing from subsurface roots. There are a few species currently in cultivation, the most common being G. atratus. This extremely attractive species has bullate foliage that looks almost black, and was at one time thought to be extinct in the wild. Its large lemon-yellow flowers are fragrant. Other species seen in cultivation are the recently described G. diverticularis, and another that has been known for much longer, G. corallinus, both with bright orange hummingbird-pollinated flowers. G. acropodus is also grown, and has interesting yellow flowers spotted with red. There is currently one species that is considered to be extinct, G. extinctus, with at least two others possibly extinct as well. The main challenge in the wild is loss of habitat, especially for the species with what at this point in time appears to be a very limited range, and forest destruction which leads to less humidity as well as higher light levels.